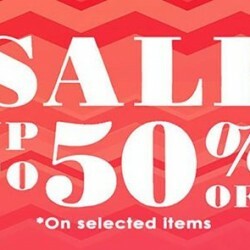 Get Up to 50% off select items @ Accessorize. So, what are you waiting for? Come and hurry! Buy 2 get 1 FREE at Accessorize. Offer limits to regular price Hair Accessories, Stationery, Jewellery (earrings, rings, bracelets, necklaces) excluding z & Star range. Strictly no mixing of categories. Free item has to be under the same category. Terms and conditions apply. Visit in-store for more details. 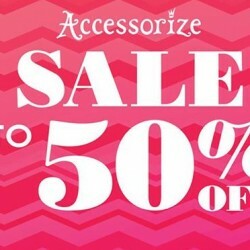 Accessorize offers everything at 50% off! All sale items are slashing at half-price! Whilst stocks last. Visit any Accessorize stores today. Good news ladies! Accessorize Sale starts today 23 Dec at all outlets! Enjoy up to 50% off on selected items. Don't forget to spread this good news around! Buy 2 Get 1 Free! On Selected Jewellery. Promotion starts today at all Accessorize stores! Hurry, visit any of the stores to enjoy this great deal. 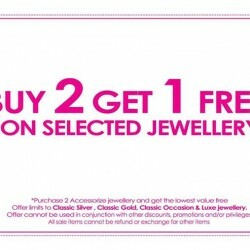 Accessorize brings you Buy 2 Get 1 Free on Selected Jewellery! On Selected Jewellery. Promotion starts today at all Accessorize stores! Hurry, visit any of the stores to enjoy this great deal! 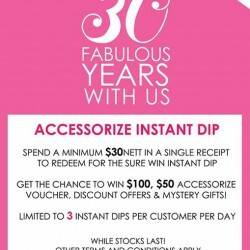 Accessorize brings you there 30th Anniversary Promotion! Celebrate this big day with them! Spend a minimum $30nett and receive a sure win instant dip*! Stand to win $100, $50 Accessorize vouchers and many more. 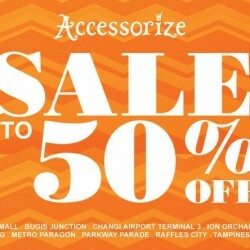 Accessorize End Season Sale just got HOTTER with more items added! 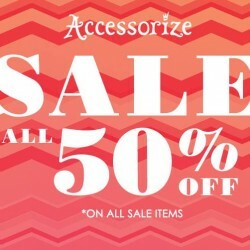 Swing by Accessorize and .enjoy Up to 50% off on selected items.